We supply, install and support all major brands of networking equipment. A business in today’s rapid digital world cannot afford to be static, and neither can its IT infrastructure. You need a network that is responsive enough to facilitate growth and innovation. It needs to be flexible, future-proof and capable enough to help your business achieve its goals instead of holding it back. A unified virtual network – a Software-Defined network allows for the linking of public and private Clouds, as well as bare infrastructure, to a single cohesive virtual network. Greater efficiency – Applications and services can be prioritised and delivered across the network instantly with centralised policy management through a Cloud-based management portal. • Time and costs saved on set-up configuration and hardware. • Routing traffic with maximum efficiency. • Central management for greater control of security, usage and other policies. • You can use your existing internet connectivity for SD-WAN, as SD-WAN is internet connectivity agnostic. • Expensive networking technology, hardware and expertise. • Dependency on hardware, requiring installations and constant maintenance. • Heavy investment in legacy network technologies required to alleviate network congestion, or to add a new branch link as the business expands. Ignite SD-WAN brings together access policy management, visibility and control over the network, performance monitoring and event-logging onto a single device through a user-friendly dashboard. A Unified Edge (uEdge) device ships to the branch office and connects over secure Datagram Transport Layer Security (DTLS). The zero-touch provisioning switch feature allows devices to be provisioned and configured automatically, enabling rapid deployment. VPN tunnels can be established once network policies and functions have been pushed down to the uEdge device. Network Address Translation (NAT) traversal support allows for VPN tunnels to be established over challenging global transport configurations. Up to 50Mbps Internet Connectivity supported per uEdge device per site. • Use more than one type of internet connection per device per site for additional redundancy, Fibre being the preferred connection medium with LTE being a close second. 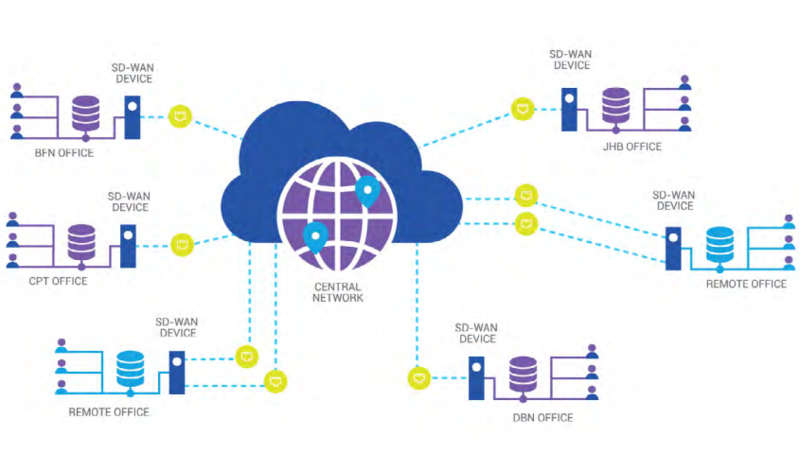 • Connectivity is a prerequisite at the intended location for SD-WAN to be provisioned successfully at your premises. • Choose your SD-WAN package and place your order on the Ignite portal. • We will contact you directly to arrange the delivery and installation of the uEdge device. A once-off set-up fee is applicable. • Billing will be triggered once the device has been delivered and the installation has been completed. • Pro-rata billing and a month-to-month contract applies. *Please note: You must ensure that your site has connectivity before you buy the SD-WAN solution.